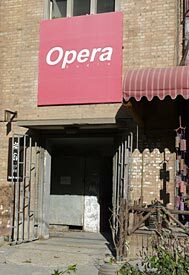 Welcome to Opera / Consonance Audio in Beijing China! Upon my arrival at the airport, none other than the owner of the company, Mr. (Eric) Shi Hui LIU, greeted me and we headed out for a brief visit to my hotel so i could freshen up and then off to dinner. i was honored with a traditional first meal of the famous Beijing duck at a truly historic restaurant that has been in business since the mid-1800s! The renown Quanjude roast duck is so special that each one comes with a serial number on a certificate of authenticity. The meal was truly spectacular and many fine Chinese dishes were served. We were joined by his wife, who also helps within the business as can be the norm in China as it is within high-end audio in general. Of course other important members of the factory were also at hand and we ate until we could simply eat no more. The next morning it was off to the factory to see how products can go from prototype to final production. Their facility is within a famous artistic part of Beijing where museums and other craftspeople's showrooms and exhibits are very close by. Up the stairs i went and immediately saw (above) the two different colors available within Opera's product line. Once inside the main showroom, to the left are listening rooms and offices and to the right are many shelves lined with the wide array of products the company manufactures. The owner of Opera Audio/Consonance is very much into DIY, and seen above is his very first project! 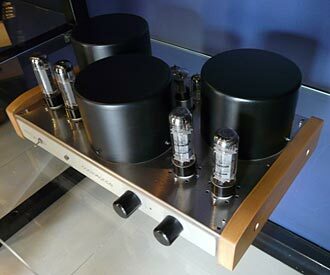 It is an EL34 stereo integrated amplifier that operates in ultralinear and produces 40 wpc. 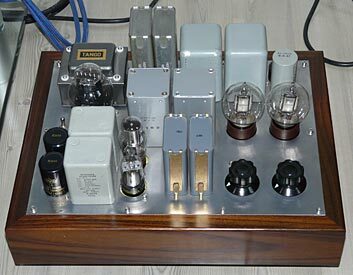 This DIY effort evolved into Opera's top-selling M100 (seen below) that has been going strong for over 15 years! 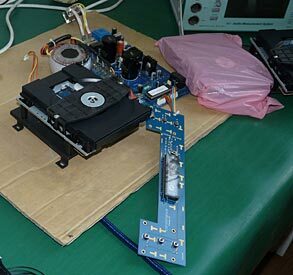 So DIYers and tweakers take note as many companies within high-end audio started out as tinkerers taking their love of music to the next level. 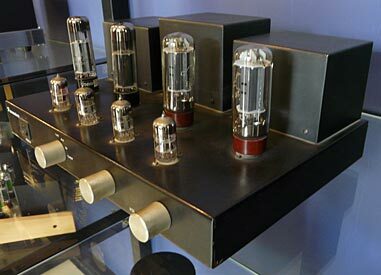 Seen here is a world first photo of a prototype of their next preamplifier that while it now uses a pair of rare WE101D tubes, the production version will have more readily available and less costly tubes. It also uses a 300B if you look carefully in the middle left of the above photo. 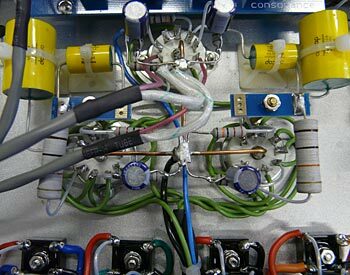 As you can also see, there are many capacitors and transformers that can be wired in or out of the circuit as they fine-tune this design to achieve the best sound before it goes into full production. 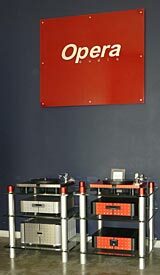 Consonance/Opera has a new base for their LP6.1 turntable Enjoy the Music.com featured a world premiere review just two weeks ago! 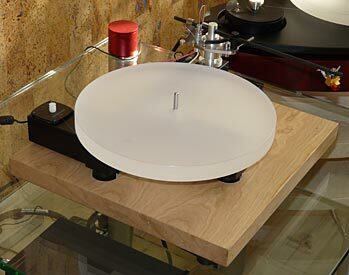 (click here for review) This newly designed base adds a dampening to the setup. Solid real wood and a combination techniques are said to assist in bringing out more defined lowermost frequencies. On the bottom of the base are four large feet with points that aids in further dampening unwanted vibrations from reaching the critical needle/vinyl interface. The base itself can come in a variety of wood and painted colors as well. A complete turntable cover is also now available. 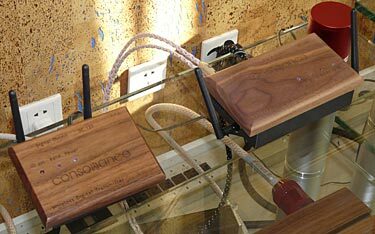 Consonance Wireless Box 1.0 system consists of a transmitter and receiver for signal transfer and has been on the market for only two months. There are two different receiving unit, one with and one without a built-in DAC. A wood-covered USB device plugs into your computer and the signal is transmitted to either of the receivers for digital output to an external DAC or analog output from the unit (on the left) that has a DAC included. Of interest is that the setup employs the USB as a pass-through of sorts and so this wireless system is claimed to handle 24-bit/192kHz. 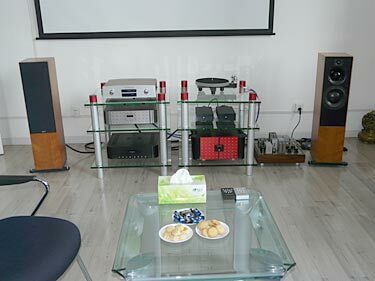 The owner, his wife and Canadian distributor Grant Fidelity sat in one of the two main listening rooms and enjoyed traditional tea and discussed Opera Audio's products and visions. Eventually we made our way to the manufacturing facility just across the hallway and i could see firsthand how parts go from testing all the way to final production. Below are a few highlights that hint at the extensive testing and breaking in that Opera/Consonance audio conducts to ensure reliability and long operating life. 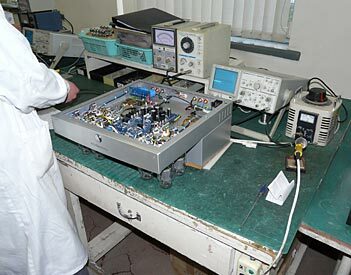 Every laser assembly is hand tested so that the optical output adheres to their strict standards. The transformers within their products are also scrutinized with measurement gear in this room. 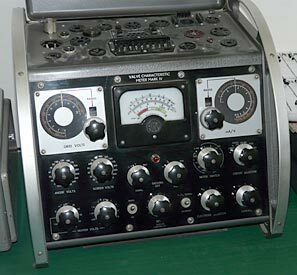 Also in this room is a tube tester that will make sure tubs in each product meet their high standards. In the next room is where more testing, burning in and assembly is performed. 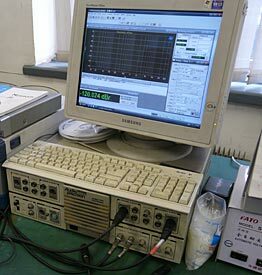 Seen here is the highly-regarded Audio Precision system. Seen above is a close-up of a small section of one of Opera Audio/Consonance amplification devices. The attention to build quality and small details, including firmly ensuring capacitors are tightly held in place, are paramount to achieving top-end sound. Attention to even the smallest of details need to be adhered to, especially within analog products such as the tonearm. 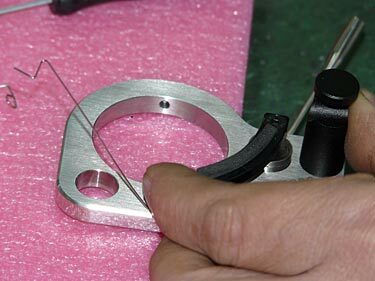 Watching the craftsman build the tonearm base was akin to seeing a Swiss mechanical movement being built. A comfortable and well prepared workstation and natural light gives a sense of peaceful working, plus like within my home there is always music playing in the background. 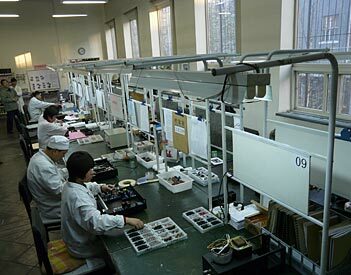 While not pictured, there are racks behind the workers where many products are undergoing many hours of careful break-in and then they may be tested for the final time to make sure it meets Opera/Consonance audio standards of quality. 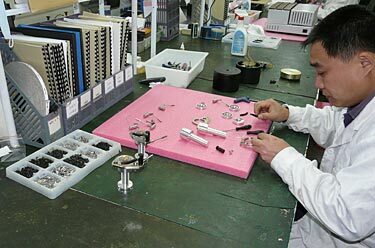 i came away very impressed to the dedication and great care each piece received and very much admire the attention to parts quality, design, wire layout and final quality control details. Click here for the main China 2009 tour page.